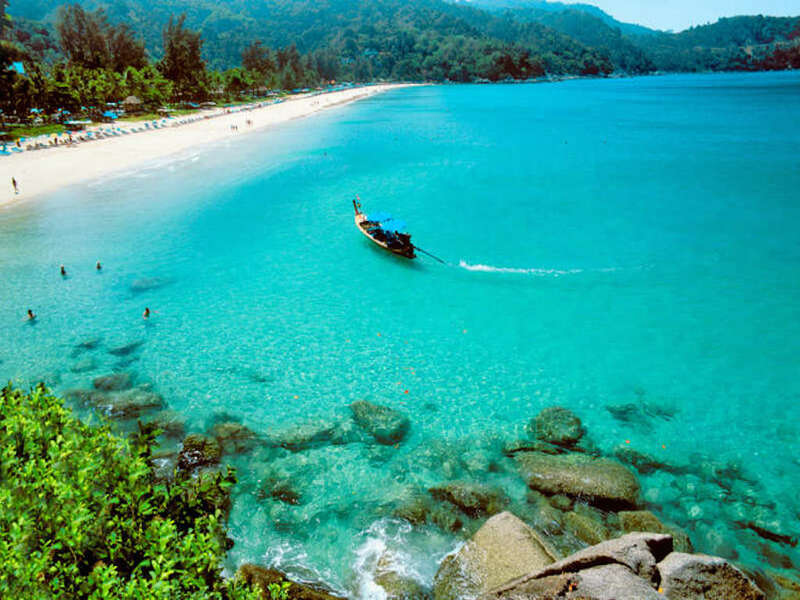 Kata is a popular and friendly beach destination and is the 2nd most popular beach in Phuket after Patong beach. The palm-lined backdrop, golden sand, dazzling clear water and the endless array of activities on offer make this area a splendid choice for an exceptional holiday. The area as a whole and the beach, is very family friendly. There is lots of shade and plenty of amenities. It has more of a family and couples vibe, than ‘lively party animal’. From May to November is surf season and for the rest of the year the water is calm and good for swimming. The beach has plenty of watersports on offer including kayaking, snorkelling, jet ski’s, banana boat rides, hobie cats and even mini golf. Kata is also home to Surf House Phuket, so you can try surfing and bodyboarding on their flowrider all year round. You’ll find a delectable range of cuisine on offer here from the impressive range of restaurants with many right on the beach. The area is not short of opportunities for shopping either, with choices such as the Palm Square shopping centre and the Kata night market. 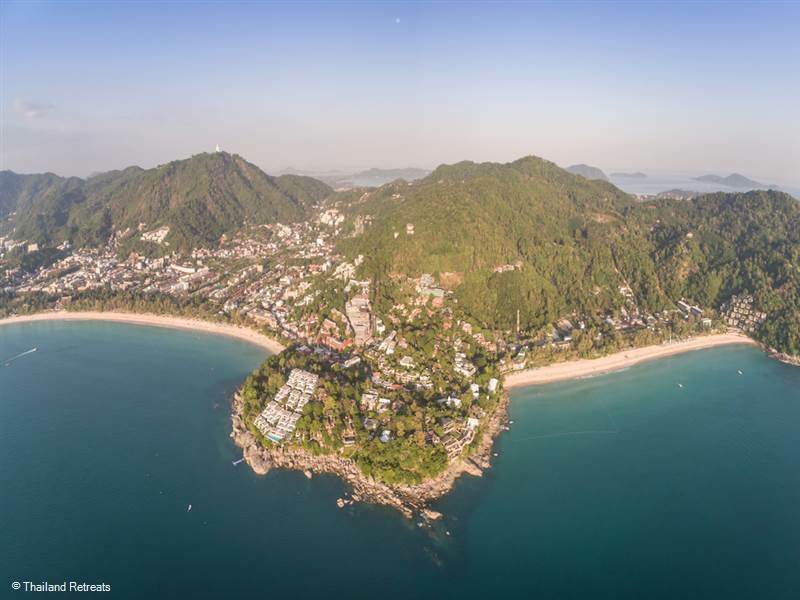 For awe-inspiring panoramic views make your way to the Three Beaches Hill viewpoint - you’ll have sweeping views of the beaches at Kata Noi, Kata Yai and Karon in the distance. Thailand Retreats has some stunning villas in the Kata beach area located on the beach headland at the southern tip of the beach. Try Baan Kata Keeree with views over Kata bay and at low tide can walk along the beach to the main Kata beach . .. It’s private and secluded, whilst still in walking distance of everything you need. The villa has its own pool and children’s pool and you can use the services of the private chef. Or try the breathtaking 8 bedroom Villa Sunyata nearby which has views over the ocean and is just a 5 minute walk from both Kata beaches. The villa has a team of staff, a cook service and lots of facilities including an infinity pool and pool table. Kata Noi is a small and pretty beach adjacent to Kata beach to the south. You can walk or taxi over to here from Kata. It’s a long stretch of golden sand, with a beautiful mountainous jungle-clad backdrop. You’ll find it is less developed than Kata beach and it’s easy to find your own private spot as it’s never really overcrowded. From May to October you’ll find this is a beach for surfers with some occasional big waves, but during December to April, you’ll discover the sea is very calm and great for swimming. The beach hosts some watersports like banana boats and jet skis .but you will find it more peaceful than Kata. There is also an opportunity to snorkel at the south end of the beach. There are a handful of exclusive resorts and restaurants here, so you can get a bite to eat and it’s quite easy to get a massage too. Thailand Retreats has some beautiful villas here. The 6 bedroom Amanzi, which sleeps 12, is in a prime position in the headland overlooking Kata Noi. As well as a private chef, waterfalls and infinity pools at this luxurious retreat, you’ll also get use of the estates tennis courts and gym. The back to back villas of Villa Malee and Villa Jasmine are just a 5 minute drive from the town and offer good value spacious 4 bedroom accomodation in each with private chef service, a roof top pool and living area.